– Florida Gators junior cornerback Joe Haden was named Southeastern Conference Defensive Player of the Week following a terrific performance against the South Carolina Gamecocks on Nov. 14. Haden collected 11 tackles (10 solo), sacked quarterback Stephen Garcia, caused two forced fumbles, took down an interception and contributed to a pass break up in the game. – Redshirt juniors transfer running back Emmanuel Moody and defensive tackle Terron Sanders are doubtful for this Saturday’s game against the Florida International Golden Panthers. Moody has suffered from chronic ankle problems throughout his career and injured it again on Saturday. Sanders’ rib injury is less worrisome, and while he will sit out the game, it could be a precaution. – There has yet to be any additional news on senior cornerback Moses Jenkins, who suffered a serious concussion back on Sept. 26 against the Kentucky Wildcats. 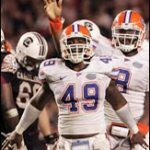 The University of Florida seemingly refuses to release more information on Jenkins’ injury, though OGGOA has covered it extensively over the last two months, most recently with this story. As far as we know, he is still waiting for the ruling on his medical redshirt. 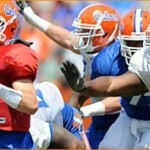 – One would expect many of Florida’s back-ups, including quarterback John Brantley, to earn some playing time on Saturday. OGGOA is purely speculating here, but there is also a chance head coach Urban Meyer benches sophomore kicker Caleb Sturgis for redshirt senior Jonathan Phillips, even if it is only a one-week thing to give Sturgis something to think about. – In his Monday press conference, senior QB Tim Tebow was eager to divulge that winning a second Heisman Trophy would pale in comparison to the chance for his team to earn another National Championship trophy. – Florida and Florida International will be teaming up before Saturday’s game to fight breast cancer. UF’s press release has much more information on the events offered for this collaboration to raise money and awareness for a great cause. I may be reading it wrong, but I don’t quite understand what the Tebow/Heisman comment means. Looks like some words were accidentally deleted. Check it out now. Good catch, thank you. What makes me sick are all these rumor-mongers who can’t let well enough alone; I mean, what part of Coach Meyer saying “I’m not going to Notre Dame- EVER” do they fail to understand? Also, why does Peter Kerasotis at “Florida Today” have such a grudge against Meyer? I read another asinine rumor about Meyer going to the Cleveland Browns at Gator Country this morning; seeing that they just hired Eric Mangini, I highly doubt that they’ll make a coaching change anytime soon. Also, Meyer has made it clear that he has no aspirations of ever going to the NFL as Steve Spurrier did – so much for all these cockamamie notions some of these sportswriters have. Those who know Meyer allude to the fact that he’s grown to really like Gainesville and is happy there; Florida is now his “dream job”. With regard to our kicking situation, I was also thinking along the same lines you were, Adam. I wouldn’t be surprised to see Meyer let Jonathan Phillips get some time out on the field against FIU, given the fact that this is his last year of eligibility. The Notre Dame decision, in my opinion, was/is Shelly’s, not Urban’s.